In the French Alps, there are many refuges which are free to use: you can turn up in most places with no reservation and stay the night. I can't seem to find any mention of these free refuges in Germany (specifically the Black Forest). Do they exist in the Black Forest and, if so, are they available to use in the same way? To go into more detail about what I mean by a refuge, the Refuges des Aubarets is a good example. I understand that they are primarily used to offer shelter to people in tough conditions, but are commonly used by hikers to spend the night. They are also known as cabane non gardée (unguarded/not looked after cabin). What's called a refuge in French is a Hütte in German. 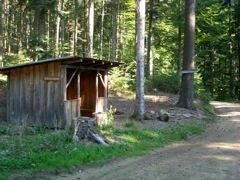 In both cases, it can be staffed (gardé, bewirtschaftet) and possibly offer some basic catering or be unstaffed (refuge non gardé, Selbstversorgerhütte) or a mere shelter (cabane or abri de secours, Notlager or Biwakschachtel). None of these are completely open like high-altitude shelters, you will need to obtain the keys in advance and in all but one be a member of one of the alpine clubs or pay a small fee (but that's the case in most French refuge too). This is a rather vague half-answer, but it's more than a comment. Through the commercial tourism association http://www.schwarzwald-tourismus.info/ I found the different organisations that take care of the national parks/reserves there. They are all listed in the footer of that page. I called the one for the north and asked. They said their part of Schwarzwald does not have any of these shelters. The lady said I should contact the tourism association directly, though I believe that would only yield commercial things like areas where tents are allowed, if those exist. There are a few more different organizations in other parts of the region, and you could email them to ask. I would go with shelter rather than refuge if you want to do it in English. In German it would probably be something like Hütte, Holzhütte or something where you can find shelter (the verbfor that is unterschlupf suchen). felias-fogg.de provides a list of Schutzhütten, which is just about any structure where a hiker might find shelter in case of rain storms. They provide a map of shelters (grey) and inns (yellow), in addition to GPX and POI files. Coordinates might deviate by 100-200m. Shelters marked "UNSICHER" might no longer exist. Last updated in 2010. Not the answer you're looking for? Browse other questions tagged germany accommodation hiking camping trekking or ask your own question.